The Sonrisas Spanish Acquire, Develop, Learn® methodology enables students to become effective Spanish communicators, globally literate citizens, and lifelong language learners. Find out more about our preschool and elementary Spanish curriculum. Focuses on student interaction with a language educator. Research does not support the isolated use of technology for acquiring a language. A language educator should be responsible for planning, instruction, and assessment. Language instruction is best guided by language educators rather than solely delivered via a computer program. Interaction with a language educator is critical to building interpersonal skills needed for real-world communication. Read more about the role of technology in the Sonrisas Spanish Curriculum. Provides a complete solution to your Spanish curriculum needs. Materials include: teacher manuals, student portfolios, music CDs, authentic literature, classroom posters, resource CDs, and supplemental online resources—everything you need and nothing you don’t. Our goal is to make our lessons straightforward and easy to follow so that you spend time teaching, not trying to figure out what you’re supposed to do. Uses second language learning research in its design. 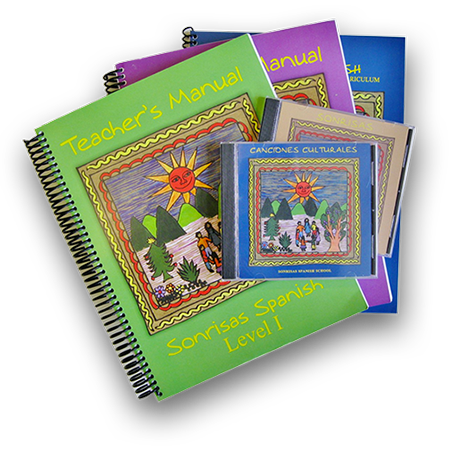 You will not find a more pedagogically-sound Spanish curriculum for young language learners. Our lessons incorporate TPR, the Natural Approach, the Theory of Multiple Intelligences, Waldorf Foreign Language Approach, Shared Reading, and our own trademarked Acquire, Develop, Learn® methodology. Our curriculum is standards-based, instructor-designed, learner-centered, and it develops proficiency in Spanish. You will receive training videos with your order which facilitate effective implementation of the curriculum. You will have the opportunity to schedule a training session via phone or video conference with your order. You can stay up to date on practical teaching tips and language learning research with the Sonrisas blog and our monthly email newsletter. Free quotes provided. Just call or email our office. 24 hour processing time and priority shipping on all curriculum orders.